This patient was a 72 year-old male with an extensive history of smoking—at the time of his biopsy he was a 55-pack year smoker. The patient had previously been diagnosed with chronic COPD, a heavy nicotine addiction, and hypertension. The patient went to the Emergency Room with complaints of progressive shortness of breath with significant respiratory distress. An Emergency Room CT scan found a small 8mm lesion in the Left Upper Lobe which was referred to Pulmonology for further inspection. 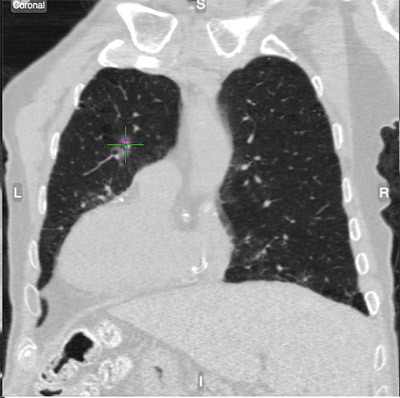 The sub-centimeter nodule was lying in the anterior portion of the lung. 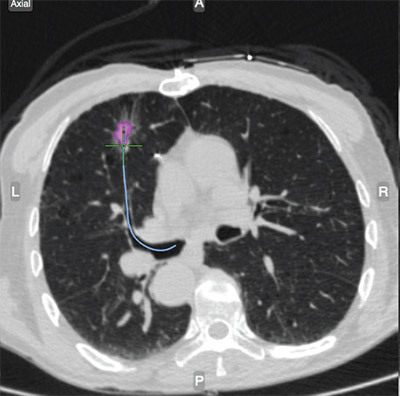 The nodule was segmented with the intent to reach endobronchially, but was also planned with SPiN Perc™, a percutaneous option, to allow for optimal sampling methods. 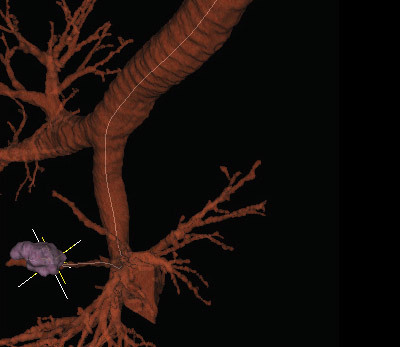 Veran’s Inspiration/ Expiration CT Scan Protocol revealed over 17mm of target motion, over two times the nodule’s diameter. The Navigated Bronchoscopy was performed with Always-On Tip Tracked® forceps. Accuracy was verified and navigation to the target was quick and precise. 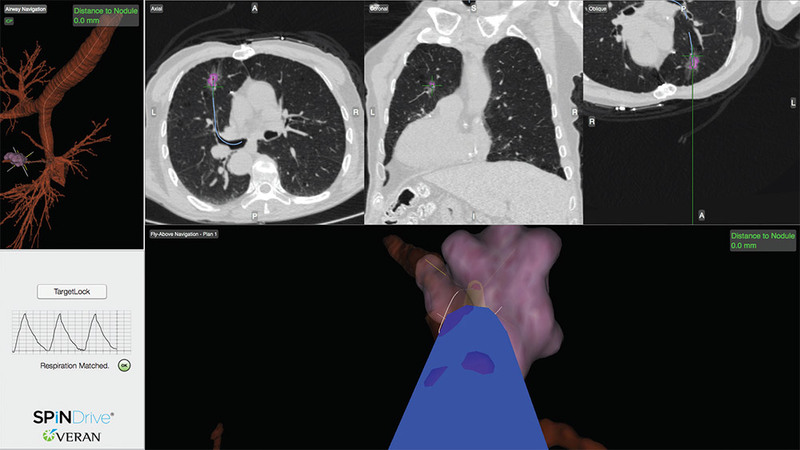 Due to target motion being twice the diameter of the lesion, accuracy was imperative to sample in the correct location and phase of the respiratory cycle. Multiple samples were taken for Rapid On-Site Evaluation (ROSE), but the first pass revealed Non-Small Cell Carcinoma. The additional samples were given to pathology for supplementary testing. The patient went on for surgical resection.